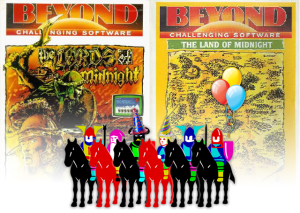 In 1984, Mike Singleton and Beyond released The Lords of Midnight. It’s hard to find an exact date, review copies were starting to appear with the Weekly Magazines toward the end of May, and the Monthlies seemed to have it in their June or July edition. On that basis, 1st June seems a good as date as any to celebrate 30 years. So, Happy Birthday The Lords of Midnight!! I believe that GoG.com will be also running a promotion this month. Also, if you want some original nostalgia, why not check it out using Spectaculator on iOS, Android, Windows. Or there is The Lords of Midnight:8 Bit on Android. Or if you haven’t tried it Multi-User why not visit Midnight/MU.